Image: AAA CEO Meagan Shand introduces keynote speaker Sarah Houbolt at Meeting Place 2017 in Berlin, Germany. Photographer: Jaqueline Homer. The grant provides travel and accommodation costs towards attending Australia’s leading national forum on arts and disability, Meeting Place, which in 2018 will be held in Alice Springs, from 24 to 26 September. Another recipient Madeleine Little, an actor, performer and theatre-maker living in Brisbane, hopes to use the skills learned at Meeting Place workshops and panel sessions to aid her Master’s study. Meeting Place is the signature event of Arts Access Australia. Established in 2012, it brings together artists with disability and industry leaders in an accessible and supported space to discuss the latest in arts and disability. Today, the forum has grown to become an annual event attracting up to 200 delegates across the national and international arts and disability sector. Meeting Place comprises a mix of professional development workshops, artistic performances and exhibitions that showcase best practice in access to the arts. These programs centre around a one-day forum with invited keynote guests discussing the latest issues in the sector. You can read more about Meeting Place or register your interest now to attend the event. The travel grant is supported by the federal Department of Social Services’ National Disability Conference Initiative 2017-18. Suzanne is the the Director of Little Dragons Integrated Dance, Music and Creative Arts Group in Northern NSW. The group provides weekly classes, day programs and Sunday and holiday workshops for people of all ages. The group participates in community events, recently performing at the 2017 Regional ArtState Conference. Suzanne has worked in the arts and disability field for more than thirty years throughout Australia and Asia. She has presented at national and international conferences, led access training workshops, curated disability exhibitions, and worked as a creative director in disability films. She is also a guest teacher and choreographer, previously working with Phillip Channels and Bangkok Dance, Thailand, among others. In 2018, Suzanne will perform with Thai artists with disabilities at the Bangkok Performing Arts Festival. Larissa is a Melbourne-based visual artist and disability activist. She works across the mediums of printmaking, street art and a community art practice. Her work is greatly inspired by her experience of disability acquired though a brain injury in 1998. Her brain injury is also what enabled her to become an artist and led to a Diploma in Visual Arts in 2010. She has been regularly exhibiting since 2006 and won several awards. Larissa has also initiated and contributed to many community art projects, which mostly have had a focus upon disability culture. This includes founding the annual Snapshots of Seddon Community photo exhibition, leading arts projects with Brain Injury Matters, stART community arts, the Self Advocacy Resource Unit, Arts Access Victoria and Footscray Community Arts Centre. In recent years, she has worked with Dangerous Deeds, a traveling multimedia exhibition, presenting a snapshot of the Victorian Disability Rights movement alongside self advocacy workshops. In 2017, she also staged two large collaborative paste up murals in Footscray exploring the concept of Disability Pride. Larissa is currently Vice President of Brain Injury Matters, Australia’s only self-advocacy group for people with ABI. Jeremy has been an exhibiting arts practitioner for over 25 years and an arts worker and disability arts advocate for over 10 years. He has worked in policy and governance with AAV and Red Inc in NSW. He has secured both state and federal funding for disability-led community arts projects and professional development opportunities with a focus on regional development. Jeremy has a forthcoming solo exhibition at Lone Goat Gallery in Byron Bay and a short film about his practice, ‘The Ghost in the Machine’ is currently showing on ABC iView. In the future, he hopes to study a Phd in disability art / representation. Ceilidh is a recent graduate of the ANU School of Art and has just started an Artist-in-Residence program with the wetlands and woodlands trust. Ceilidh previously worked as an accountant, but a chronic migraine condition inspired her to explore alternative pain therapy. Through this, she found that creative focus was more effective than any medication. Ceilidh now loves to work in inclusive art and facilitate the artistic vision of disabled artists as well as exploring her own. Fiona is an award-winning screenwriter, director, producer and developer. As well, as being a creative practitioner, Fiona has worked in a diverse range of leadership and educational roles across the screen, arts, literary and disability sectors. 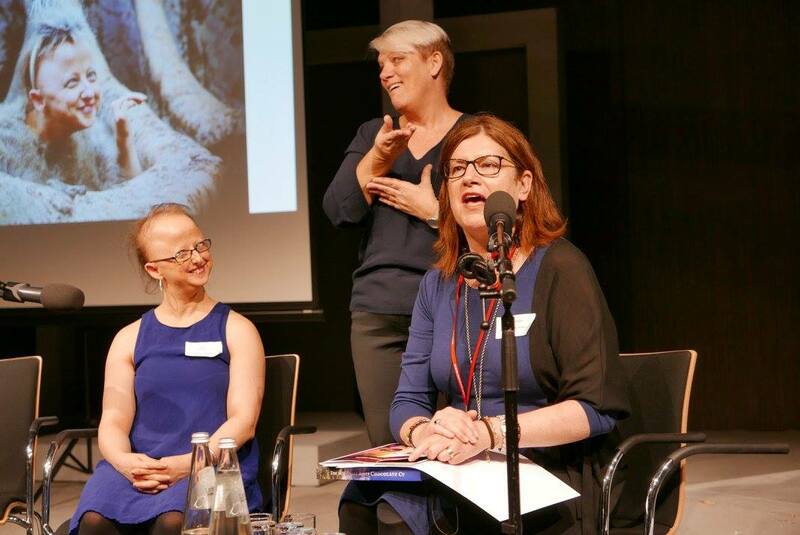 From 2012 to 2017, Fiona was Mentor-in-Residence on the award winning and international best practice model Write-ability program for writers with disability (Writers Victoria and Arts Access Victoria). A recipient of 2017 Screen Australia initiative Seeing Ourselves: Developing the Developer, Fiona is now working as a Script Developer and Screen Inclusivity Consultant and is developing an innovative slate of disability-led screen projects. Madeleine is an actor/performer and theatremaker based in Brisbane with a passion for disabled leadership and inclusive/accessible theatre practice. Since 2015, she has been a member of the IndelabilityArts Ensemble, most recently working as an actor (Look Mum… No Hands! [The Legless Bar Years]) in the Adelaide Fringe Festival (2018) season. She also performed in Restless Dance Theatre’s ‘Intimate Space’ at Festival 2018. Madeleine holds a Bachelor of Fine Arts (Drama) from Queensland University of Technology, and is currently studying a Master of Arts (Creative Arts) focusing on accessible theatre-making practice with University of Southern Queensland. Eliza Hull is a musician, writer and radio announcer. Eliza’s debut album ‘The Bones Of Us’ was strongly supported by radio stations including Triple J, ABC, FBI, PBS and 3RRR. Eliza has also had syncs in TV shows ‘Awkward’, ‘Teen Wolf’ and ‘Saving Hope’. Eliza has a strong live following, selling out shows in Australia, touring New York and the UK, and sharing stages with Katie Noonan, Husky and Mia Dyson. Eliza is also a disability activist and speaker and aims to raise awareness within the music industry and wider circles. Eliza was recently awarded the ‘Regional Storyteller’ scholarship with the ABC. Evelyn is a Noongar Woman from Perth and the founder of an Aboriginal support group for children with autism, ADHD and other disabilities. The support group is called Be My Koorda, meaning be my friend/brother. Their vision is Community Culture and Inclusion. Evelyn is a mother of five, with two children with disability. She has a Diploma in Mental Health and has worked in the Disability sector for three years in various roles, including Vice-Chair on a Co Design project being launched later this year. She is also a Board Member with Kalparrin, the largest support agency for supporting kids with special needs in WA. She currently works for WAIS as an Aboriginal Resource Developer. In 2017, she was a finalist in the City of South Perth Volunteer of the year award. **This article was updated on Tuesday 3 July to include additional recipient Eliza Hull.